Version 2.29 of DiffEngineX was released today. It has better error handling when the two Microsoft Excel spreadsheets being compared contain cells with problematic text containing invalid characters. The problem this release fixes only occurred when Microsoft Excel 2007 (rather than Excel 2003, 2010 or 2013) was installed. 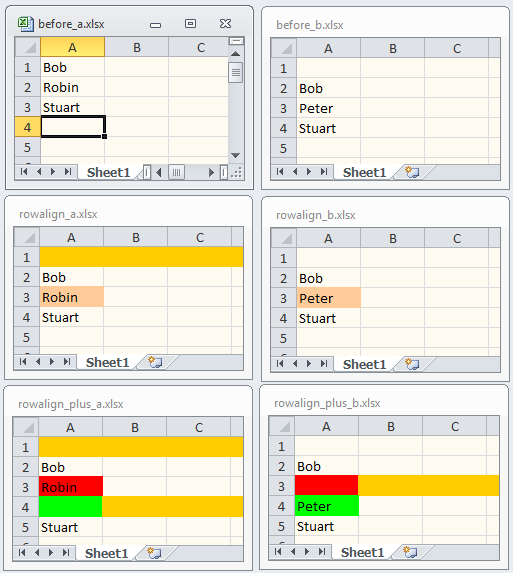 We have recently released a new style Office app for Excel 2013 and Word 2013. It will not work with Office 2010 or earlier. In Excel 2013, it will find the differences between the text in two selected cells. It fetches the cell value. The formula can be manually copied and pasted into the app if desired. It is potentially useful in reporting the differences between two long formulae or simply lengthy blocks of cell text. 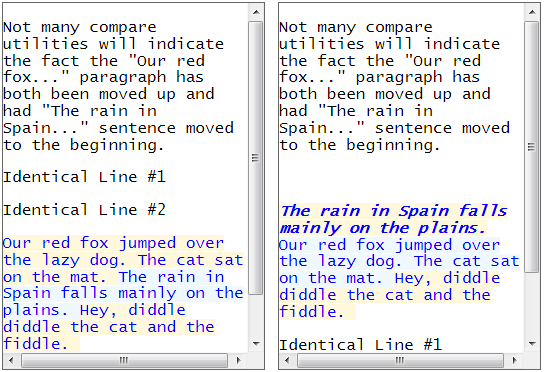 In Word 2013, it reports the plain text differences between two different document selections. Although it runs inside Office, it can act as a simple clipboard diff tool. Please note it uses new Microsoft technology and only works in the desktop versions Excel 2013 and Word 2013. Potentially it could be rather useful in Word Web App when Microsoft update it to support Office apps. It can be found in the Microsoft Store. Of course if you want a full featured Excel diff tool that compares all the formulae, values, comments, names and VBA macros for practically all versions of Excel, there is always DiffEngineX. In the screenshot above we can see that the text of the paragraph has been colored blue as it has been moved up in the document. Additionally the sentences have been reordered. Indicating this, the background color has been changed to alternately light blue and yellow. Not many compare utilities are capable of this. At some point we may release this as a stand-alone utility running outside of Microsoft Office. Excel add-ins (.xla and .xlam) must first be converted to workbooks (.xls and .xlsm) before using DiffEngineX to compare them. The steps to achieve this are described below. Use File->Open to open the file in Excel. In the Project Explorer window in the Visual Basic Editor, you will see an entry similar to VBAProjectName(Add-in file name *.xla). Click the plus sign to the left of this. You may need to enter a password at this point. Expand Microsoft Excel Objects and click ThisWorkbook. From the Tools menu select VBAProjectProperties... . Select the Protection tab. Uncheck "Lock project for viewing". Clear both the password and confirm password boxes. Select "Close and Return to Microsoft Excel" from the File menu. For Excel 2007 and later select File->Save As and then select Excel Macro-Enabled Workbook (*.xlsm). For Excel 2003, select File->Save As and then Microsoft Office Excel Workbook (*.xls). Once your Excel add-ins (*.xla and *.xlam) are converted to Excel workbooks (*.xlsm or for Excel 2003 *.xls), you can use DiffEngineX to compare them. Click here for instructions on how to do this.